I am a strong proponent of spending time on figures, tables and presentations so that important ideas are communicated clearly and succinctly. The story of this internal letter written by Nicholas Kristof to his colleagues at the New York Times is a good example of why. I'm sending you a copy of the story and graphic by interoffice mail. whoever did the graphic should take a bow. The info-graphic/table that got Gates' attention. Apparently, the letter itself is framed and hanging up in the office of the data graphics group at the NYT. h/t Pam. 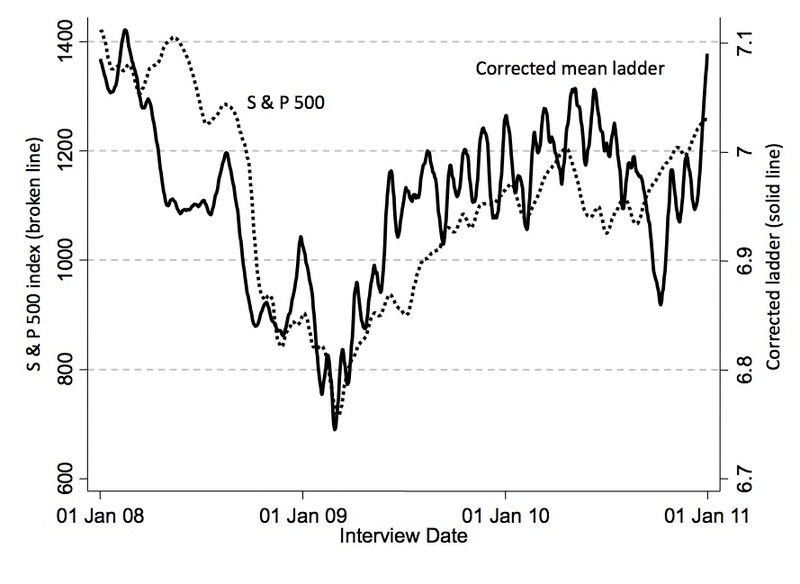 Although preliminary estimates from published literature and expert surveys suggest striking agreement among climate scientists on the tenets of anthropogenic climate change (ACC), the American public expresses substantial doubt about both the anthropogenic cause and the level of scientific agreement underpinning ACC. A broad analysis of the climate scientist community itself, the distribution of credibility of dissenting researchers relative to agreeing researchers, and the level of agreement among top climate experts has not been conducted and would inform future ACC discussions. Here, we use an extensive dataset of 1,372 climate researchers and their publication and citation data to show that (i) 97–98% of the climate researchers most actively publishing in the field surveyed here support the tenets of ACC outlined by the Intergovernmental Panel on Climate Change, and (ii) the relative climate expertise and scientific prominence of the researchers unconvinced of ACC are substantially below that of the convinced researchers. 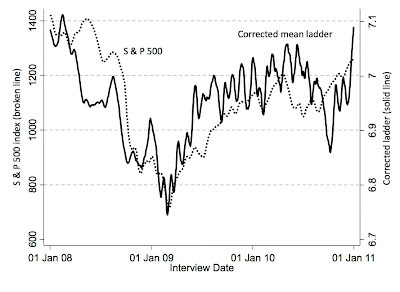 I particularly like the use of independent metrics to verify what my casual observation as a researcher says to be true. 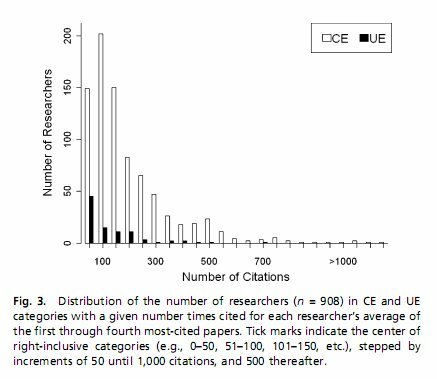 Now, there's clearly potential endogeneity in this system since citation behavior can be strategic (e.g., this new paper in R.E. Stat), and many a scientific discovery has been waylaid by collusive behavior among scientists (see, for example, the rise and fall of radical mastectomies as detailed in Emperor of All Maladies, previously here). That said, the next time someone tells you there's a legitimate scientific debate over whether anthropogenic climate change is occurring, I think you can safely make a "we are the 98%" joke. Abstract: The Agricultural Adjustment Act (AAA) caused a population shift in the United States in the 1930s. Evaluating the effects of the AAA on the incidence of malaria can therefore offer important lessons regarding the broader consequences of demographic changes. 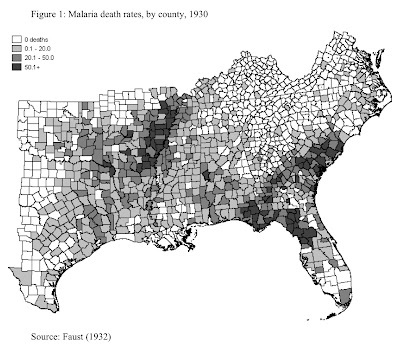 Using a quasi-first difference model and a robust set of controls, we find a negative association between AAA expenditures and malaria death rates at the county level. 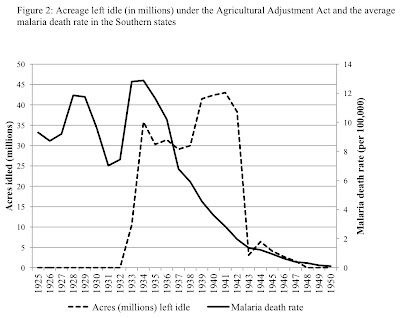 Further, we find the AAA caused relatively low-income groups to migrate from counties with high-risk malaria ecologies. 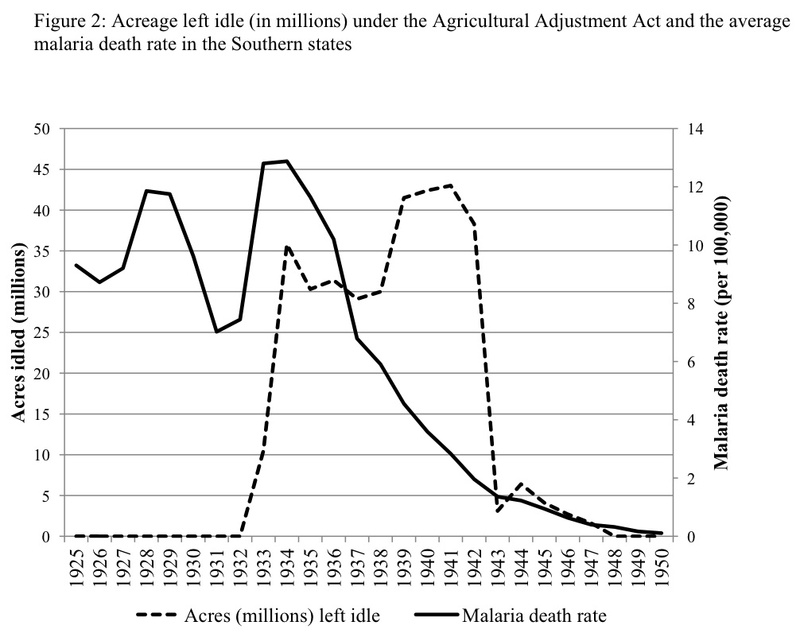 These results suggest that the AAA-induced migration played an important role in the reduction of malaria. Over a year ago, I pointed readers to this paper after seeing it at WCERE and thinking it was important, so I'm happy to hear that its now forthcoming in ReStat. It is also is also an excellent example of individuals increasing their resource consumption, when they becoming richer, by increasing their trophic level (described two posts ago). The paper finds that when households receive cash transfers, they consume more meat, which requires more rangeland, which induces additional deforestation. Abstract: We study the consequences of poverty alleviation programs for environmental degradation. 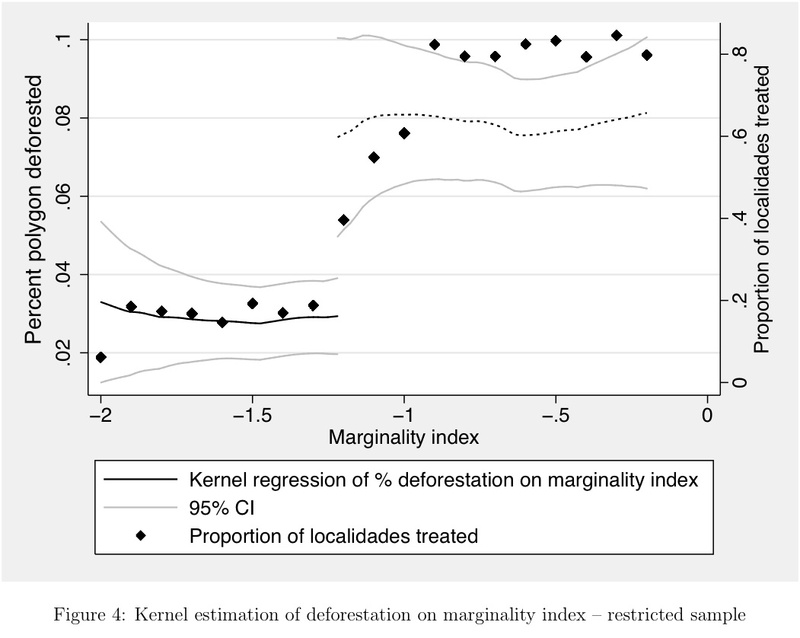 We exploit the community-level eligibility discontinuity for a conditional cash transfer program in Mexico to identify the impacts of income increases on deforestation, and use the program’s initial randomized rollout to explore household responses. We find that additional income raises consumption of land-intensive goods and increases deforestation. The observed production response and deforestation increase are larger in communities with poor road infrastructure. This suggests that better access to markets disperses environmental harm and that the full effects of poverty alleviation can be observed only where poor infrastructure localizes them. Across the continent, an estimated 92 million girls and women have undergone [genital cutting]. But like more than 5,000 other Senegalese villages, Sare Harouna has joined a growing movement to end the practice. The change has not yet reached Ms. Kande’s new home in her husband’s village, but if elders there pressured her to cut the baby girl she is taking into the marriage, she said, “I would resist them.” Her parents back her up. “They would never dare do that to my granddaughter, and we would never allow it,” said Ms. Kande’s mother, Marietou Diamank. [H]ere in Senegal, Tostan, a group whose name means “breakthrough” in Wolof, Senegal’s dominant language, has had a major impact with an education program that seeks to build consensus, African-style, on the dangers of the practice, while being careful not to denounce it as barbaric as Western activists have been prone to do. The movement's success is heavily attributed to its inclusivity and consensus building, and the anecdotal evidence in the article seems to back it up. The fact that Tostan's strategy heavily involves griots, traditional story tellers who are somewhere between musician, MC, and radio personalities, seems particularly intuitive and appealing, a bit like trying to get celebrities and athletes in the US to speak out against smoking. Along those lines, attributing of the program's success to having tailored itself to "African-style" consensus building seems rather small-minded. There are obviously many ways to get people to change their behavior (taxation, accolades, providing information ...), but abolishing genital mutilation seems to be a classic case of changing social norms, and when you think about it, a social norm is nothing more than a codification of expectations over the everyone's behavior. Changing a social norm involves shifting from one equilibrium state of expectations (everyone knows genital cutting is common and necessary and if my daughter doesn't undergo it she and my family will be judged) to another (everyone knows genital cutting is dangerous and unnecessary and if someone asks my daughter to do it they're crazy) for the entire group of individuals. It is, by definition, establishing a consensus. I think we can thus say that Tostan's success (to the extent that the success is Tostan's and not attributable to larger demographic forces) lies less in exploiting some native preference for consensus that "Africans" have than in focusing efforts on small clusters of individuals with correlated norms (villages), and then propagating that norm change through the next-closest set of clusters (neighboring / inter-marrying villages). That Tostan works to convince those individuals in an inoffensive way (try convincing anyone, anywhere, to stop doing something because it's 'barbaric') seems necessary but not sufficient to effect that change. Jesse and I are working under a deadline, so our posts are suffering. Here are some links that might distract you from our inability to do two things at once. Create a data visualization for global groundwater trends and have your work shown on the side of a building in Times Square. A million dollar prize is awarded to a company for designing a more efficient oil skimmer. Video below. Also, this is just plain amazing (from Jesse). 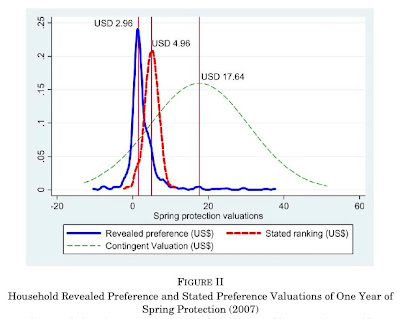 Trophic level as a measure of economic development? Here we show the fraction of the world’s total cropland that is dedicated to growing food crops (crops that are directly consumed by people) versus all other crop uses, including animal feed, fibre, bioenergy crops and other products. Averaged across the globe, 62% of total crop production (on a mass basis) is allocated to human food, 35% for animal feed (which produces human food indirectly, and less efficiently, as meat and dairy products) and 3% for bioenergy crops, seed, and other industrial products. There are striking disparities between regions that primarily grow crops for human consumption (such as Africa, South Asia, East Asia), and those that mainly produce crops for other uses (such as North America, Europe, Australia). The Eurobarometer poll suggests that the majority of the public in the European Union consider global warming to be one of the world's most serious problems, with one-fifth saying it is the single most serious problem. Overall, respondents said climate change was the second most serious issue facing the world, after poverty. Abstract: This paper offers a critical review of modeling practice in the field of integrated assessment of climate change and ways forward. Past efforts in integrated assessment have concentrated on developing baseline trajectories of emissions and mitigation scenario analyses. A key missing component in IAMs is the representation of climate impacts and adaptation responses. Through the examination of conceptual, theoretical and empirical frameworks for the analysis of climate impacts and adaptation, we identify five characteristics of an ideal IAM: regional and sectoral detail for impacts and adaptation strategies; distinct representation of the three types of adaptation—adaptation through market adjustments, protective/defensive expenditures, and adaptive/coping expenditures; intertemporal decision making under uncertainty; induced innovation in adaptation-related technologies; and connection with empirical work on impacts and adaptation. Our review of existing IAMs finds that most models are severely lacking in most of these modeling features. S. Jobs (1955-2011) finished changing the world today. 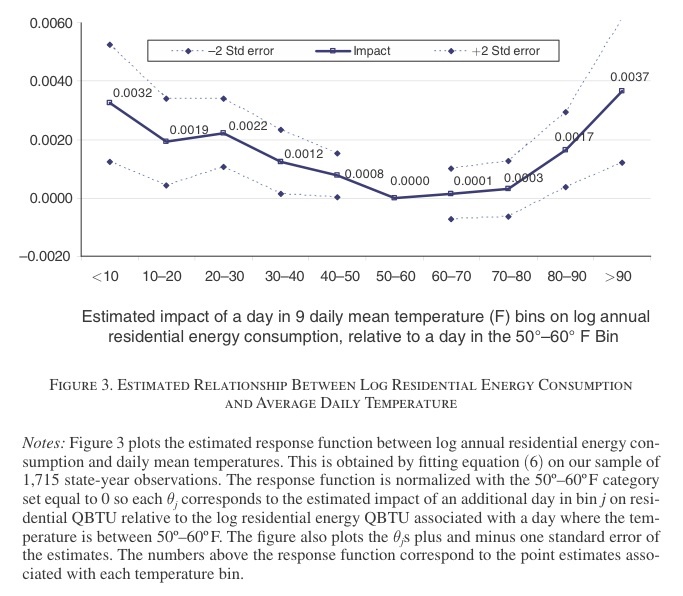 Abstract: Using random year-to-year variation in temperature, we document the relationship between daily temperatures and annual mortality rates and daily temperatures and annual residential energy consumption. 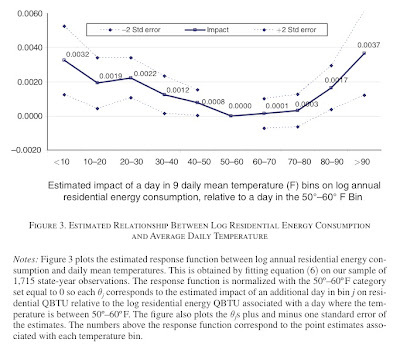 Both relationships exhibit nonlinearities, with significant increases at the extremes of the temperature distribution. 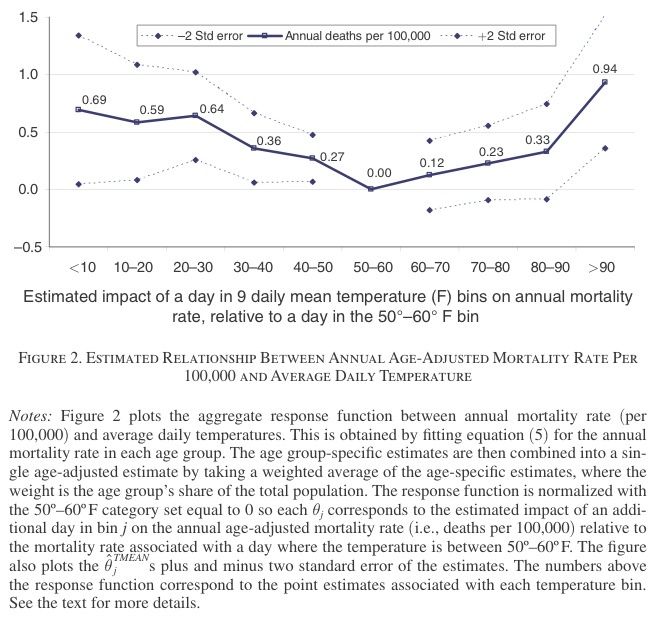 The application of these results to "business as usual" climate predictions indicates that by the end of the century climate change will lead to increases of 3 percent in the age-adjusted mortality rate and 11 percent in annual residential energy consumption. These estimates likely overstate the long-run costs, because climate change will unfold gradually allowing individuals to engage in a wider set of adaptations. More on temperature's substitutes/compliments here and here. Did the global climate cause dark ages and golden ages? 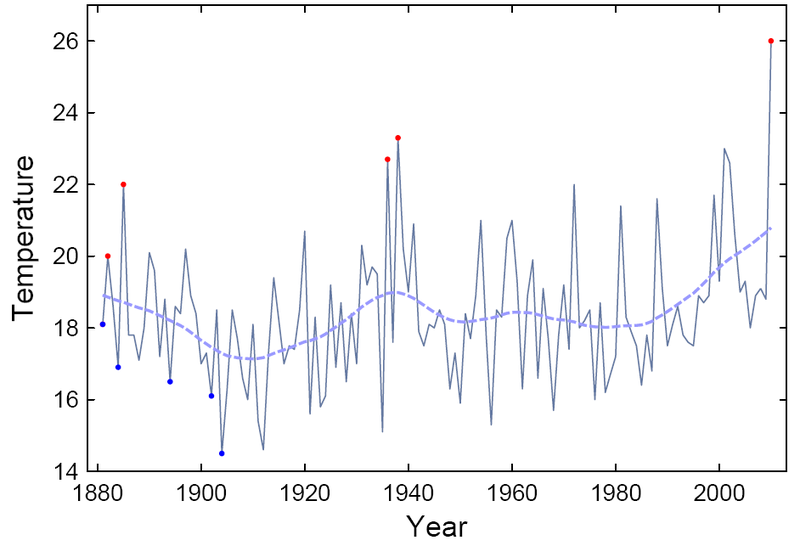 Abstract: Recent studies have shown strong temporal correlations between past climate changes and societal crises. However, the speciﬁc causal mechanisms underlying this relation have not been addressed. We explored quantitative responses of 14 ﬁne-grained agro-ecological, socioeconomic, and demographic variables to climate ﬂuctuations from A.D. 1500–1800 in Europe. Results show that cooling from A.D. 1560–1660 caused successive agro-ecological, socioeconomic, and demographic catastrophes, leading to the General Crisis of the Seventeenth Century. 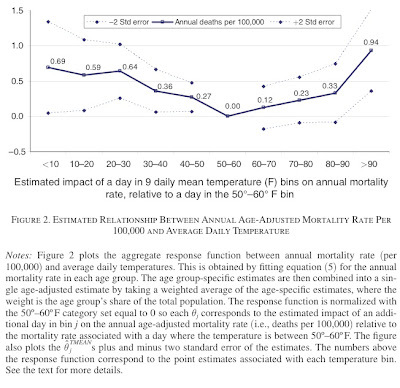 We identiﬁed a set of causal linkages between climate change and human crisis. Using temperature data and climate-driven economic variables, we simulated the alternation of deﬁned “golden” and “dark” ages in Europe and the Northern Hemisphere during the past millennium. Our ﬁndings indicate that climate change was the ultimate cause, and climate-driven economic downturn was the direct cause, of large-scale human crises in preindustrial Europe and the Northern Hemisphere. Zhang et al. have done an impressive job of collecting, organizing and making sense of many pieces of data. If links from the global climate to food supply to conflict were underlying historical periods of unrest, this will certainly change how we understand historical developments in Europe. The work by Zhang et al. is particularly interesting because they have tried to examine the detailed pathways that link the global climate to social upheaval. 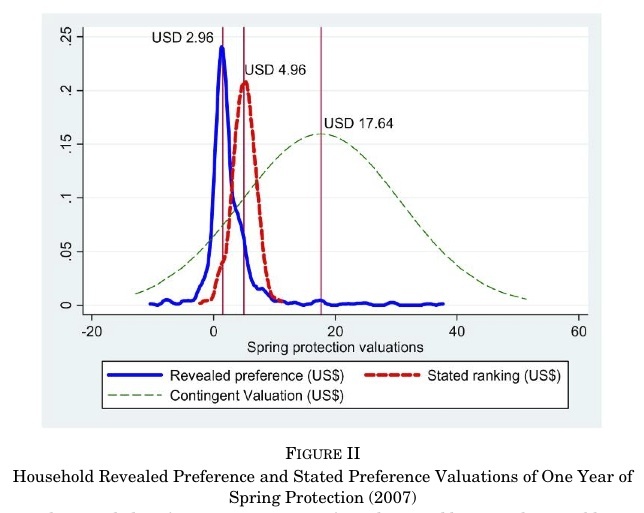 Their finding that agricultural productivity, agricultural wages and food prices all might have contributed to conflict agrees with a number of leading hypotheses in the field, and they are certainly consistent with observations made in other studies. It is difficult to know exactly how much these findings can tell us about the modern world, since many things have changed since 1800. However, it is worth noting that per capita incomes in Europe at 1800 were similar to those we observe in many modern low income countries, such as Bangladesh, Haiti, Nepal and much of Sub-Saharan Africa. So if poverty is a key factor in the link between the global climate and conflict, the global population in the 21st century is still not wealthy enough that we can consider ourselves "out of the woods."